Welsh scientists intend to use the latest printing technologies to develop a low cost biosensor capable of diagnosing a range of health conditions. The aim is to place living antibodies into a suitable ink which would then be printed onto a compatible substrate or material to form a disposable sensor, capable of being mass produced at low cost. Antibody based assays are routinely used to detect specific medical conditions but use of these tests is limited because they need to be carried out in laboratories by highly skilled technicians which is costly and time consuming. By contrast a printed array of antibodies speeds up the testing process while reducing the expertise and complexity of equipment needed – introducing the possibility of hand held electronic scanners and far quicker diagnosis. It allows this aspect of patient care to be moved from hospital or laboratory to the GP surgery, releasing expensive hospital resources for other activities. It could also prove invaluable for use in emergency humanitarian situations and in remote areas. The project is supported by the Welsh Government’s Academic Expertise for Business (A4B), an EU funded initiative to stimulate and encourage collaboration between educational institutions and industry. 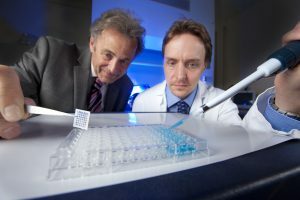 Image: Professor Tim Claypole (left) and Dr Chris Phillips, Senior Research Officer, comparing a printed array with a multi-well plate that is currently used. Edwina Hart, Minister for Business, Enterprise, Technology and Science, said: “A4B supports the commercial exploitation of new ideas in Wales and in this instance, in the high growth area of medical diagnostics. The industrial collaboration is led by Swansea University’s Welsh Centre of Printing and Coating which is teaming up with the Institute of Life Science and industry. The partnership includes Micropharm, which produces antibodies at its base in Newcastle Emlyn, Abertawe Bro Morgannwg University NHS Trust, and Innovia Films of Cumbria, which will provide advice on the choice of substrate and materials. Professor Tim Claypole, who is leading the research, said the project is at the forefront of international research and represents a major advance in the printing of biomedical sensors. “It builds on previous research on the printing of functional materials, but is a completely novel application that would not progress without the support of Welsh Government funds. The initial focus will be developing a proof of concept device that will open opportunities to develop antibody sensors to diagnose a broad range of health conditions.